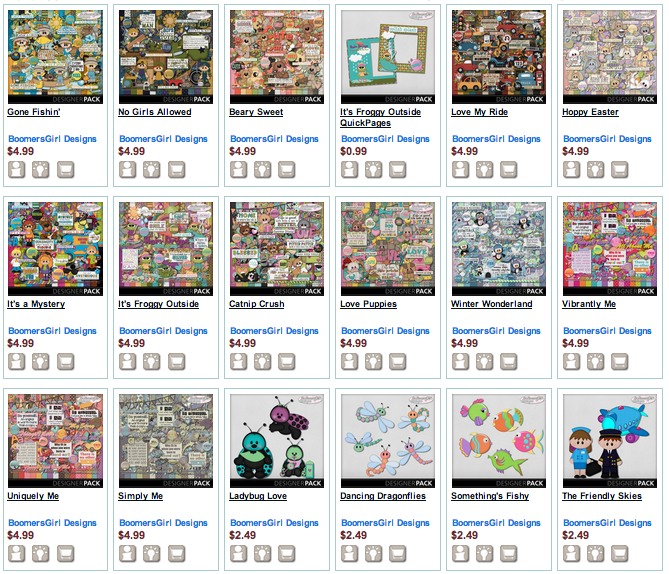 MyMemories Blog: Meet this week's Featured Designer - it's Lori from BoomersGirl Design!! Meet this week's Featured Designer - it's Lori from BoomersGirl Design!! Header Banner kit: *It's Froggy Outside* from BoomersGirl Design!! PROMO CODE: BoomersGirl30 this week! I'm the married mom of 6 wonderful kids - 5 boys and 1 girl - from age 5 through 18. I've been a nurse for over 22 years, working with elderly people who I adore. I have been scrapbooking since my oldest was a baby as a way to preserve all those precious memories that would otherwise be lost. I switched to digital scrapbooking several years ago. I love it because it's faster, easier, takes up no space and - best of all - it's cheaper! I have seven albums going at the same time - albums for each of the kids as well as family albums. I started designing a couple of years ago as a creative outlet and to help out with family finances so I can stay home taking care of my home and family most of the time. My goal is to create fun, colorful kits and clip art that reflect on the most important things in my life - family, love and God. Take a peek at these AWESOME goodies in her shop! Love the colours of No Girls Allowed. Gone Fishin is also lovely. The animals in your kits are very cute. I love your healing hands kit. I'm a nurse and it has so many amazing elements!!!! All of her kits are amazing. I really like Dragonfly Dreams because I like dragonflies, and purple is my fave color. Love No Girls Allowed. I've 5 grandchildren - 4 girls and 1 boy. They have all been here for the Easter weekend and this kit is exactly how he is feeling after 3 days with all those girls!!! !